Note: This is the second of two posts as a follow up to the Online Learning Conference (OLC) which was held in Denver October 6-8, 2015. The first post shared rapid-fire tips to support any mobile learning effort. One of the more compelling statistics I share lately with people while networking at conferences is that the average American spends 5.6 hours a day on the web as per Mary Meeker’s Internet Trends 2015 presentation. And, an ever-increasing percentage of that time is on mobile devices. On and off the job, people are reaching for their mobile devices to solve problems, learn a task, collaborate with each other, and entertain themselves. Perhaps that number is higher than expected, but it should not surprise to anyone that mobile devices have increasingly become integrated into daily life. Yet knowing, Float talks to many learning professionals that still say their company or organization is “not ready to do mobile.” The 5.6 hours statistic alone should hit those same companies like a cold bucket of water that the time for getting ready is past. Their audiences need and want content delivered on the mobile platform to help them do their jobs better – performance support–and they want it now. The good news is that mobile and performance support is a perfect marriage. Performance support is supplying targeted information to an end user at the time of need. It’s specific and useful content that is integrated seamlessly into their workflow. And mobile is just that–it moves with the user, agile and constant, keeping them connected with an infinite supply of resources and connections. 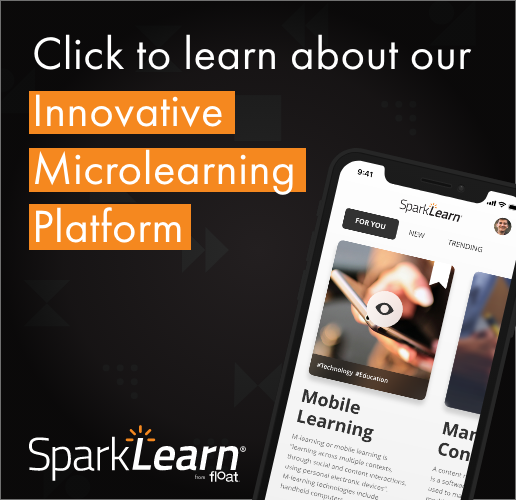 To learn more about the nine attributes of mobile and other emerging technologies that help improve workplace performance, download the CHAMPIONS Starter Kit or read our previous posts on the CHAMPIONS framework. This “perfect marriage” of mobile and performance support was the subject of my second presentation (embedded as a SlideShare at the end of this post) at OLC 2015: Getting the Most Out of Mobile in Performance Support. To leverage mobile for effective performance support, it is helpful to remember the ACT principle: Audience, Context, and Technology. Let’s look at these three major components. I’ve said it before, and I’ll say it again: Know thy audience. We already know they are using their mobile devices at all times of the day and night–probably even on the job whether it’s allowed. This occurrence can be a goldmine of information. What types of content are they accessing? Are they connecting and collaborating with each other? Are there apps or sites they don’t like? What are there mobile device habits and tendencies? For instance, if you found out that employees were exchanging short videos on how to solve a specific job task, perhaps an online library of short videos provided by the company is in order. Or, if a particular industry website was consistently being accessed, why not curate the information from the website that is the most useful to your audience and packages it as a company deliverable? Once you know more about the users for your mobile performance support, you need to know everything about the environment in which they will receive the information. Is the use of a mobile device too distracting or even unsafe within their workflow? Perhaps they truly need to be “hands-free” and you might look at options like a headset or glasses. Will the elements like light, sound, dust or weather influence their usage? Do they wear gloves or safety glasses that could impede interactivity with the device? Are they because of customers while they are on the job and will mobile device usage make a negative impression? The only way you can answer these questions is to step into the world of your users and determine a strategy that delivers strong content in the context. These devices are amazing. The long list of affordances of what mobile devices are capable of is impressive. Are there ways you can leverage these device capabilities to make your mobile performance support even stronger? Consider the Safe Site for Forepersons mobile app developed by Apple & IBM. This app allows forepersons to move around their facilities and test and report safety conditions and record their observances into the app. Micro-location in the device provides their position within the facility resulting in immediate reporting of a safety problem. Geolocation, the accelerometer, the camera, video–all of these and more can strengthen and enhance performance support by offering real-time, specific information. You should also know the specifications of your target devices. Do they have enough processing power? Will they have a strong enough Internet access? Have you identified your target operating systems? The last thing you want to do is to develop a performance support deliverable that has trouble running on the target devices resulting in bad user experiences. Are you ready to ACT on mobile performance support? Ready or not, you should be delivering mobile performance support. Get to know your audience better than you ever have before, learn everything you can about the context in which they will use your solution and understand the technology of the devices and systems at work in your organization. What are success stories you have in reaching your audiences on the mobile platform in performance support situations? Leave your examples in the comments section below and let us know how you used the ACT Principle.